Certain changes occur when your dogs get older - some of which we do not see or even appreciate! Their bodily functions will slow down and this may result in a number of medical problems. 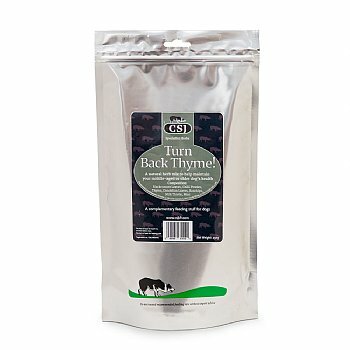 For instance, difficulty after a walk or exercise in getting up; kidney problems, liver problems, skin problems and so on.. Over the years we have developed a very successful range of herbal supplements for dogs in treating certain problems but 'Turn Back Thyme!' is aimed with the "older dog” in mind. 'Turn Back Thyme!' contains herbs for all round health but with particular benefits such as Blackcurrant & Thyme - Respiratory Problem and Colitis etc Rosehips - Good, natural source of Vitamin C Mint - to aid digestion Milk Thistle - to keep the liver healthy Dandelion - to flush the kidneys and keep the animal passing water correctly Cayenne - an all rounder with specific value to treat high blood pressure. It is also an aid for problems with the stomach and ulceration if present. A daily dose of the mix should be added to your dog's dinner - either once a day or split into two. Comes in a 250g foil pouch. Review: I got this for my two older boys aged 10 and 14. The 10yr old is particularly fussy with food, so I was apprehensive about adding herbs - I should not have worries - he loves them and has really found a new spring in his step. Very pleased. "It Does What it Says !!!"